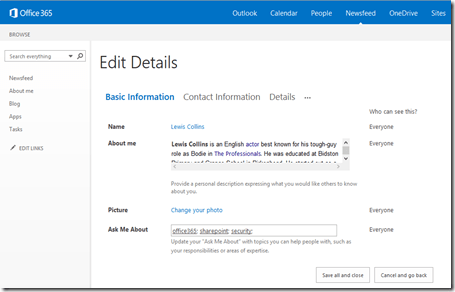 One of the first things I encourage all SharePoint Online users to is go in and edit their profile and update the information contained in there. They can do that by clicking on the user image in the top right and then selecting the About Me menu item that appears. However, what happens if a business wants to enter this information ahead of time from one central location? Here’s how to do just that. 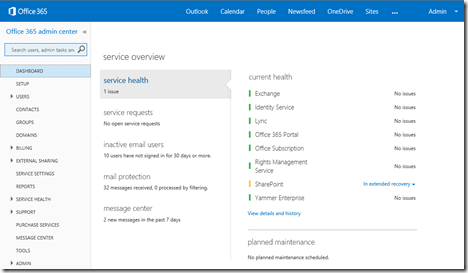 Sign into the Office 365 web portal as an administrator. 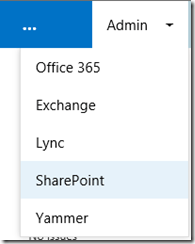 In the top right of the portal select Admin, then SharePoint from the menu that appears. 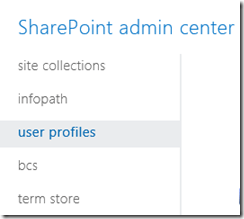 In the SharePoint admin center select user profiles from the menu on the left. On the right hand side select Manage User Profiles from under the People section at the top of the page. 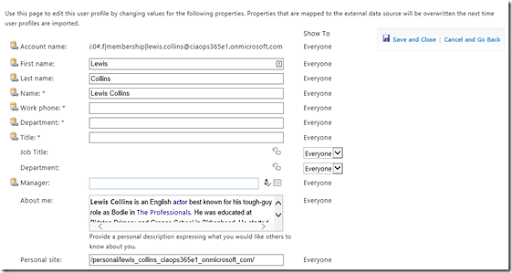 Search for the user profile you wish to edit (here, Lewis Collins) by entering the search text in the Find profiles box and press the Find button. The user should then be listed below. If you now click on the account name a menu will be displayed. Select the item Edit My Profile. You should now be able to go into every item for that user and make any changes required. Remember to Save your changes when complete.